At first I did not like it at all. 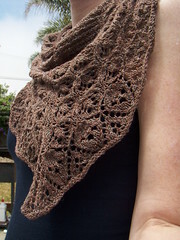 The yarn is 100% silk and stiff to knit with. Once it was done, washed & laid flat to dry I was disappointed that it hadn’t softened up at all. So, I threw it in the dryer with some permanent press items & voila! It worked, softened up nicely. I would never call this soft, but it is light weight, nice next to the skin and balls up to next to nothing! Gorgeous! I really like the brown colour you chose, brown goes with so much.